Here is a fun fact about me you don’t know. I have eighteen nieces and nephews with one more due to arrive in May. Isn’t that crazy? The youngest of them is Isaiah. He is such a great kid and I am so proud to be his Auntie! Yesterday my sister and brother-in-law hosted a fabulous party celebrating his 1 yr Birthday with 150 of their closest friends and family. Part of my birthday gift to my sweet nephew was to make a small birthday cake he could eat all to himself. When trying to come up with ideas on what type of cake to make I had a difficult time trying to “figure it out”. There was no theme for the party other than the colors yellow and grey. I also wanted to come up with a design complimenting the style of Isaiah and his parents. 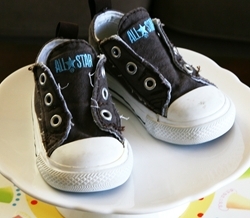 My nephew has the cutest Converse All-Star sneakers and when I saw them last week I instantly knew I had found my inspiration. I asked if I could bring his shoes home with me and from there I started to make mental notes of how I would re-create them. 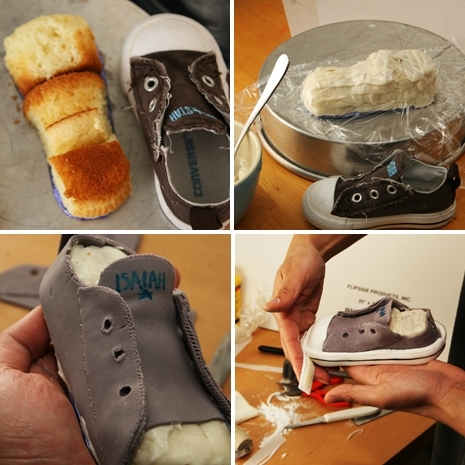 The cake version had to be a realistic (as possible) replica of his shoes to scale. 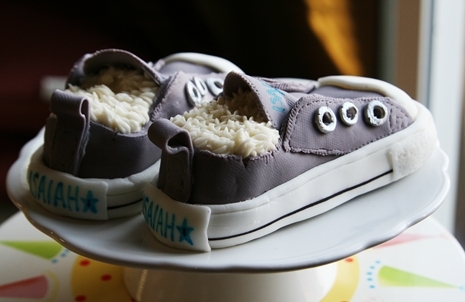 I textured fondant to make the shoes have a canvas type of appearance. 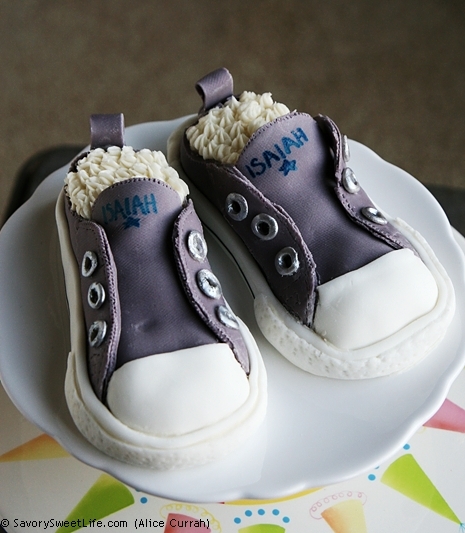 I painted edible silver metallic paint for lace eyelets and used food coloring pens to write Isaiah’s name and to draw a black line around the base of the shoe. 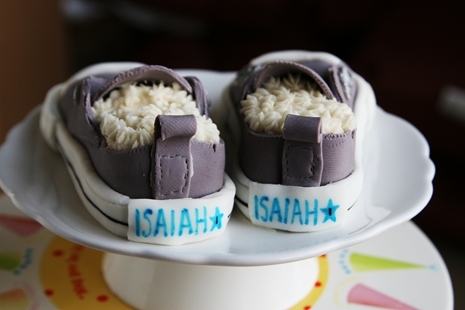 I tried to make some of the seams look frayed and the cake itself were 3 cupcakes (per shoe) bonded together by buttercream frosting and carved to look like Isaiah’s shoe. After attaching the last eyelet I took a step back and just beamed with happiness. The shoes were better than I could have hoped for. I quickly took a picture with my phone and sent it to my sister. She texted me immediately afterward sharing her excitement about the finished cake. By the time I cleaned up the kitchen I was so tired I accidentally grabbed the cakes believing they were the real shoes and stayed up a little longer fixing whatever it was that needed fixing as a result.. oops! 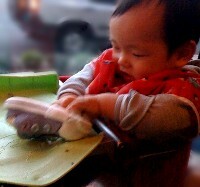 My sister sent me this picture of Isaiah eating his birthday shoe this morning. I’m told there is video as well and I can’t wait to see it. 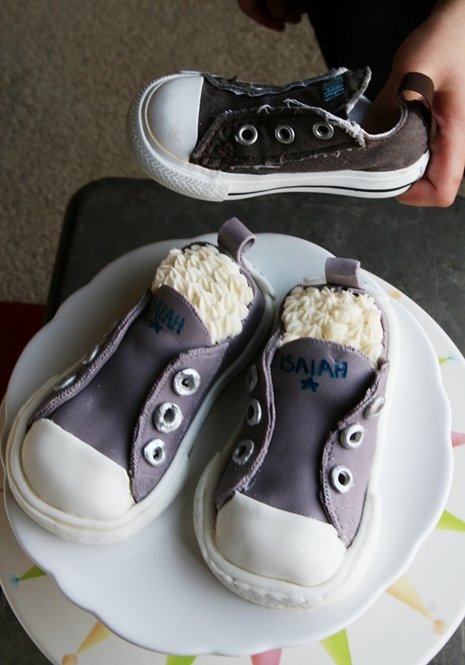 Anyway, I wanted to share with you a clever idea for a kids birthday cake. I plan on doing a more detailed tutorial of how I made this cake in the future eventually, stay tuned! Wow! All the cakes are just great! This cake is amazing, I am really speechless! This is such a fantastic work, wonderful findant and I can imagine the happy boy’s face! This is just great! I was wondering what you used on the bottom for the sole of the shoe? Is it fondant or fondant gumpaste ratio? 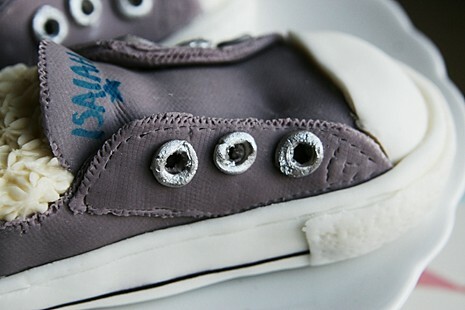 Do you have the tutorial on how to make this sneaker ? I would love love to learn from you. Hi Jewel, I actually do not bake cakes for sale anymore. However, maybe you could print off the picture to a local bakery and see if they can replicate it. wow this is amazing !!! very cute.. I was wondering when you are going to post the tutorial to make this? 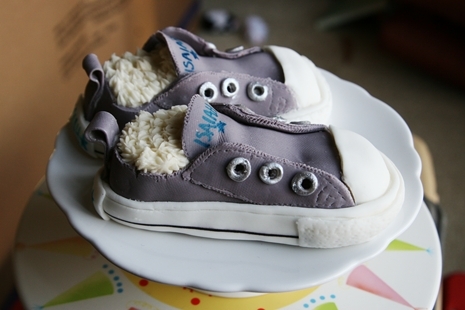 I would love to know the details to make this for my nieces first birthday. That’s a fantastic idea, cakes look so natural, from pictures at the beginning I thought that you were putting a cake into snickers and only after I read the article I understood. Oh my god, what a lucky little guy. 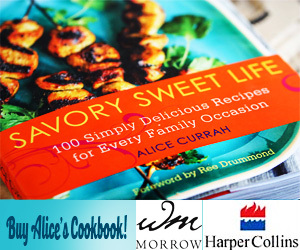 This cake is phenomenal, Alice! So impressed!!! !